HOUZZ: PREFERRED BUILDER in SIOUX FALLS - BRANDON - HARRISBURG, SD. Custom Home Builder and Luxury Home Remodeling. Earning 5 STAR REVIEWS from our clients, your neighbors, since 1999. 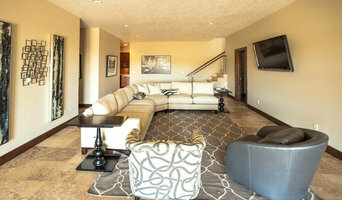 Deffenbaugh Homes is a custom home builder in Sioux Falls, SD that prides itself on its work. Dudley Deffenbaugh, owner of Deffenbaugh Homes, knows what makes a home: creativity and quality. Dudley works hand in hand with the customer molding each and every one of their homes from conception to perfection. Custom home building is a process. From initial design, Deffenbaugh Homes helps the customer generate a design and layout of their home, developing a relationship along the way. This relationship is built on trust. Having full trust from the customer is the only way Deffenbaugh Homes does business. Close interaction from start to finish reassures the commitment set forth by Deffenbaugh Homes to each home owner. Deffenbaugh Homes invites you to join their exclusive client community by calling (605) 231-9328 or by contacting Dudley at info@deffenbaughhomes.com. Jarrod Smart Construction is a design-build company executing upscale residential or commercial projects on time and on budget. We also offer remodeling, residential and commercial lot selection assistance, and much more. Not satisfied with the status quo, our company is committed to bringing the brightest ideas, the latest innovation and the best quality to every job. To maintain these high standards, we have our own crew of quality craftsmen and do not subcontract every single phase of construction. Our own people do a large portion of the work to ensure high levels of quality in not only the finishing touches you can see, but also the foundations and structure that you can’t see inside the walls. Unlike builders who subcontract most tasks, we have direct control over the details of every project. In contrast to common stereotypes, we bring a very high level of professionalism to the construction industry. We don’t rely on “rules of thumb” or guess at certain construction specifications, but count on the professionals we hire to deliver a sound product. From soil testing to structural engineering and energy certifications, we use the right people for the right jobs to engineer a quality product – a Smart product – that we can be proud of. "BEST ON HOUZZ " – Award winner 6 years in a row (2014 - 2019) More than 25 years experience in Interior Design, Space Planning and Project Management. I have successfully designed several exciting projects of various magnitudes. My portfolio consist of several Retail, Hospitality, Health, Commercial and Residential projects. My extensive travel around the globe has enabled me to study the local culture and their influence on the Architectural Design Elements. With this unique combination of International education and experience, I know that I am THE perfect designer for any project. Whether a small space, a full remodel, or a new home or business, we begin with you, discovering your dream, planning the perfect space even before the blueprints are drawn. Or, anytime along the way. We work not only with you, but also your contractor, to other professionals to coordinate your project from the beginning to the beautiful finish, keeping things on track, on budget, and true to your vision. We don’t just stand by and watch others make your project come to life, we’re right there, planning, painting, plastering, while searching across the region for the perfect pieces to complete your decor. Beginning to end, we help prevent those headaches, hassles and hardships, creating your vision, making your dream come true. Scott's Lumber-For all your building needs. Providing quality interior design since 1975. Whether it's a small project or a complete new build, we work closely with our clients to turn their house into the home of their dreams. It's my absolute passion and pleasure working with wonderful people to make their dreams of a beautiful home come true. I love getting to know my clients and their families, and helping direct the design to meet their individual style and design goals. Whether working from a blueprint of a new home or remodel plan, or simply adding the finishing touches of gorgeous custom draperies and accessories, I can help make your plans come to life. Nothing beats the smile on a client's face when my part is done, and my client says, "This is even better than I imagined!" What an amazing feeling! Sioux Falls Kitchen & Bath is a custom cabinet maker and mill work supplier. We pride ourselves on providing high quality custom cabinetry and mill work, to the area's top builders. As the heart of the home, your kitchen deserves a personal designer, and that is just what we provide. Our designers are experienced in creating the type of kitchen environment that is functional AND provides a welcoming space where families gather and life long memories are made. Cabinets and cupboards are crucial organizational components of any kitchen or bathroom. Yet, for such an essential element, homeowners often compromise on their cabinetry, settling for cabinets that neither complement their style or meet their needs. Custom cabinetmakers in Harrisburg, SD has the transformative power to create a practical yet personalized space unique to you by creating custom cabinets that have all the storage elements you need as well as the stylistic ones. Custom cabinets have the benefit of being designed specifically for you in terms of both appearance and usability. When it comes to stock cabinetry, you are limited to generic, cookie-cutter designs, dimensions and colors, which isn’t ideal for outfitting a uniquely shaped kitchen or for showcasing your personal style. Custom cabinets are solely crafted based on your specifications and needs, and while they are pricier than pre-made pieces, you’ll receive a higher level of craftsmanship and durability when you work with a professional on Houzz who specializes in custom cabinets in Harrisburg, SD. Create an ideabook on Houzz and save examples of the custom cabinets you want — this will help your Harrisburg custom cabinetmaker get on board with your vision and make your design a reality. Additionally, if you are undergoing a remodel, keep in mind that a blueprint needs to be finalized prior to any kind of cabinet building and installing; given the one-of-a-kind nature of a custom cabinet, room dimensions need to be completely finalized before any work can commence.